Open Car Transport vs. Enclosed | Which Auto Transport is Best? When you decide to ship a car, you have to make a few decisions. From the beginning you’ll be asked about your vehicle, route, and desired delivery date. You’ll also be asked how you’d like to have your vehicle transported. While open car transport is the most common choice, for some people, enclosed auto transport makes the most sense. This post covers the differences between the two transport types, and why you may chose one over the other. In most cases, shipping a car with on an open trailer is the most affordable option. With an uncovered “open” car carrier, your vehicle is loaded onto a trailer, typically with 9-10 other vehicles. Part of the reason uncovered open car transport is less costly, is that more vehicles can be transported with each shipment. This is more efficient for the transporters as less fuel and hours on the road are required to move more vehicles. Another type of vehicle transport is enclosed auto shipping. Are you thinking about shipping a valuable, rare, or classic vehicle? Enclosed auto transport keeps your vehicle safe from the elements in a hard-sided carrier. However, as fewer vehicles can be transported in an enclosed trailer, the cost to ship each vehicle is higher. There are many benefits to shipping a vehicle in an open carrier. First and foremost, it’s cheaper. More vehicles per shipment means a lower average cost per vehicle is required for the shipment to be profitable for the transporter. Secondly, open car transport is the industry’s standard. As a result, more open car carriers are available, transporting along more routes. So if you’re in a time crunch, you may turn to open transport to get your vehicle scheduled and delivered faster. When museums, auto shows, classic cars owners and many high-end vehicle owners want to transport a vehicle, more often than not they choose enclosed auto transport. Enclosed trailers are hard sided and equipped with a lift gate service. Thus, the lift gate includes a ramp that lowers all the way flat to the ground. This enables vehicles to be driven onto the ramp, and then raised up into the carrier. Using a lift gate service prevents low clearance vehicles from scraping during the loading and unloading process. 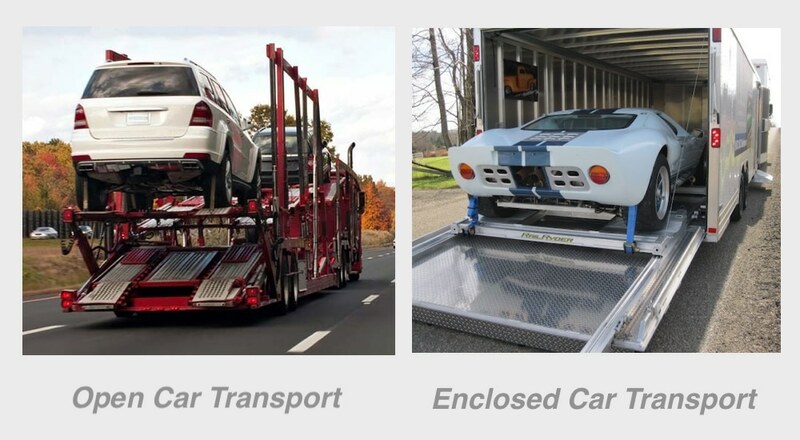 Most high value luxury and classic vehicles are transported in enclosed car carriers to ensure they are not exposed to the elements during transport. Depending on the route and time of year, weather can be an issue. Additionally, open car carriers are exposed to rocks and other road debris that can chip or damage paint en transit. All reputable auto transport companies provide insurance. Since your vehicle will be insured while in transit, the risk of paying for damage out of pocket is removed. So why not go with the less costly option, open car transport? Enclosed car carriers typically offer higher levels of transport insurance coverage. Most of the enclosed car carriers All Day Auto Transport uses carry up to $2 million / vehicle cargo insurance policies. Adequate insurance coverage protects both the vehicle owner and the transporter, and provides peace of mind. Since 2009, All Day Auto Transport has only worked with fully insured and reliable drivers who provide excellent customer service. Regardless of the type of auto transportation you select, your driver will always be in touch. All Day Auto Transport gives each customer a direct phone number to their driver. And drivers will always call and/or text one hour before the scheduled pick-up and delivery times. Transporting vehicles across the country is All Day Auto Transport’s forte. We have one of the largest networks of open car transport carriers and enclosed car carriers, and a vast supply experienced drivers. In the last decade, we’ve safely transported tens of thousands of vehicles across the country. Many of which were luxury vehicles — including Rolls Royce Ghosts and Rolls Royce Phantoms. So regardless of your vehicle type, or shipping preference, we have you covered. If you have questions about which type of vehicle transport is best for you, please do not hesitate to reach out to All Day Auto Transport at (888) 567-7396 or by requesting a free quote. Next PostIs it Better to Use a Local Auto Transport Company or a National Company?